Interact-As is an instant closed captioning, anywhere and anytime. 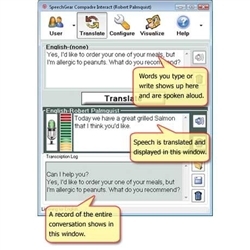 Interact-AS supports speech, typing and handwriting. In addition, individuals who are Deaf can directly communicate with people who do not know sign language; a person that is Hard-of-Hearing can now instantly see a closed-caption transcript of what’s being said, be it a conversation, a conference room discussion, a radio broadcast, or a video program. Also people that have difficulty writing or typing but have verbal skills, can use their voice to dictate memos, answer test questions, or generate text for documents and emails. 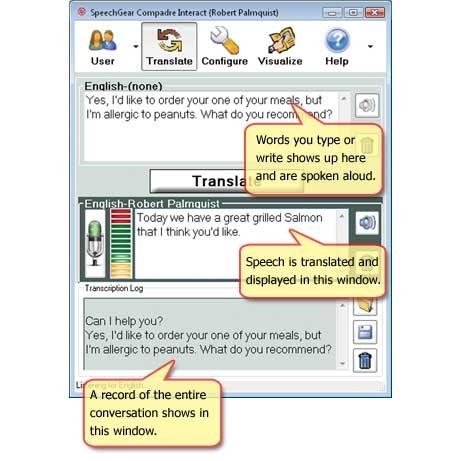 Interact-AS gives a voice back to individuals who have lost the ability to speak (e.g., ALS patients) by voicing aloud whatever a person types or writes; and with the optional Language Modules. Interact-AS instantly translates conversations to and from foreign languages. Use Interact-AS wherever you go: at work, at parties, in stores, restaurants – instant communication anywhere, anytime with anyone and even in multiple languages. Written or typed words are instantly spoken. Run Interact-AS on your PC or purchase an already configured system.